Mike Gnefkow, Sr., age 69, of Raymore, Missouri, passed away on March 26, 2018 at the Kansas City Hospice House, from complications sustained in a fall back in December. Mike is survived by his devoted wife of 51 years, Susie Gnefkow; his children, Christine Hime (husband, Phil), Michelle Van Trump (husband, Kevin), and Michael Gnefkow, Jr. (wife, Blanca); five grandchildren, Jordan, Skyler, Kennedy, Nick, and Quinn; his mother, Elizabeth Joyce Gnefkow; his brother, Jim Gnefkow (wife, Vicki); sister, Susan Sexton (husband, Tom), mother-in-law, Kathryn Douglas; and Godmother Mary Sparling. He was preceded in death by his father, William J. Gnefkow; two brothers, Robert Gnefkow, and William Gnefkow, Jr.
Mike was born on April 2, 1948, in Kansas City, Missouri. He was the son of William J. Gnefkow and Elizabeth Joyce (Grant) Gnefkow. Mike was a proud graduate of Rockhurst High School in 1966. He claims his biggest stroke of luck came when he met an amazing girl from St. Teresa Academy named Susan “Susie” Douglas. They were married in North Carolina, in January of 1967, and have been happily married for 51 wonderful years. Together, as best friends and soul mates, the couple was able to overcome all odds and obstacles to accomplish what many can only dream about. Having to provide for his family, Mike began a blue collar career joining the Asbestos Workers Local Union #27. Working many long hard hours, he was able to claw his way to the top of his profession, all while being an amazing husband and father to three wonderful children. He also found time to hold several positions with Local Union #27, offices of Financial Secretary, Executive Board, and Pension Board. Mike also served as Chairman of the Board for the South Metro Fire Protection District for 19 years and on the TIF Committee for Raymore, MO. Mike had an uncanny knack and passion for staying ahead of the curve and understanding economic trends and cycles. This helped fuel his passion for investing. Through the years he was able to amass an extensive real estate portfolio, large stock portfolio and even became the owner a company called “The Mutual Fund Store” in Fort Lauderdale, Florida. Mike had obtained a private pilot’s license, he was never afraid of change, risk or hard work. Much more important however than Mike’s career or financial accomplishments, was the amazing role-model and “rock” he became to his entire family. He coached his children in little league and always tried to attend all of his grandchildren’s events. To say his family meant the world to him would be huge understatement. His unwavering loyalty, contagious smile, famous one-liners, beautiful blue eyes, and worldly wisdom will be forever missed. Mike’s family would like to extend a special thank you to “Team Mike” for showing such loving care and support to Mike and his family throughout this difficult time. A special thank you to sister-in-law, Dianne Gormly, for all the help. Visitation will be held from 5:00-8:00 p.m., on Monday, April 2, 2018, at St. Catherine of Siena Parish, Kansas City, Missouri. Mass of Christian Burial will begin at 10:00 a.m., Tuesday, April 3, 2018, at the Parish. A reception will take place after the service at More Hall- St. Thomas More Church, 11822 Holmes Rd. KCMO, 64131. Memorial contributions may be given to the Kansas City Hospice Foundation (kchospice.org); City Union Mission (cityunionmission.org); or to the Salvation Army (salvationarmy.org). Marie A. (Helfrich) Bock, age 69, of Raymore, MO, passed away Saturday, May 28, 2016 at her home. She is survived by her husband, John H. Bock; sister, Barbara Knobbe (Joe); stepsons, John and Paul Bock; grandchildren, nieces, nephews, great nieces, nephews, brothers and sisters-in-law. Memorial service begins at 2PM, Saturday, June 4 at Cullen Funeral Home, with visitation from 1-2PM. In lieu of flowers, the family suggests donations to St. Agatha Church Pantry (930 Withnell Ave., St. Louis, MO 63118). Abraham Raymond Hagerty was stillborn November 11, 2015 at Centerpoint Medical Center. He is preceded in death by Great Grandparents: Don and Patricia Wiegers, David Hagerty, Jr., Edward and Penny Palmer, Jr., Quentin Anderson, Raymond Knutson. 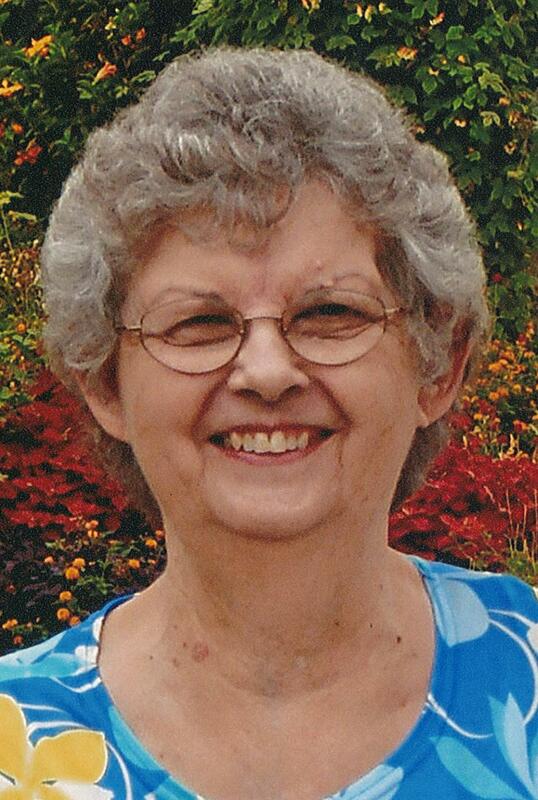 Frances Anne Hoover, 78, Raymore, Missouri, died Sunday, September 13, 2015 at Foxwood Springs Living Center in Raymore. Funeral services were held Wednesday, September 16, 2015 at the Atkinson Funeral Home in Harrisonville with burial in Wills Cemetery in Peculiar, Missouri. Frances was born March 30, 1937 in Raytown, Missouri, the oldest daughter of Edward Earl and Annabelle (Blue) Oldham. She was a 1955 graduate of Peculiar High School and had lived in Peculiar for most of her life. She had lived in Alabama for 13 years before returning to Peculiar in 2013. Frances was a member of the Rockford, Alabama Baptist Church. She was a homemaker and a master gardener. Frances was preceded in death by her parents and a daughter, Cindy Ann Lane. She is survived by two sons, Rob Hoover (Diana), Lee’s Summit, Missouri and Ron Hoover (Tracy), Harrisonville, Missouri; one daughter, Sue Duck, Peculiar, Missouri; two brothers, Robert Earl Oldham, McKinney, Texas and Edward Dean Oldham (Kay Jean), Peculiar, Missouri; one sister, Cheryl Janssen (Ben), Peculiar, Missouri; 6 grandchildren and 2 great-grandchildren. (Arrangements under the direction of Atkinson Funeral Home, Harrisonville, MO. Online condolences may be made to atkinsonfuneralhome.com). 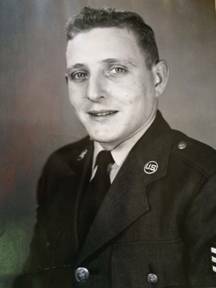 James D. (Jim) Pirie, US Air Force Lt. Col Retired, died peacefully surrounded by family in his Belton, MO home on Tuesday, September 15, 2015. Jim was born May 5, 1933 to George L. Pirie and Mabel Pirie and grew up on a farm in Plover, IA. After graduating from Plover High School and working as a school bus driver, for a telephone company and in miscellaneous other jobs, Jim joined the US Air Force as an aviation cadet in 1954 where he received his commission. This program later developed into the Air Force Academy. He proudly served his country during a 20 year career, during which he flew multiple aircraft with the most flying hours logged in various versions of the C-130. He was recognized with numerous distinctions, including multiple air medals and four Distinguished Flying Crosses awarded while flying AC-130 aircraft in Southeast Asia. His second career in the field of education began at Raymore Peculiar Middle School as an industrial arts teacher where he retired 14 years later. During and after his tenure at Ray-Pec, he was instrumental in launching the Lee’s Summit Christian School, now known as the Summit Christian Academy. While there he served as a board member, teacher, principal and advisor to the school board. Jim was a generous man with his time and resources and had an abundance of love for his Lord and Savior, his family, friends and country. He had a genuine influence on those who knew him well and those who knew him briefly. He served his Lord until the very end in various capacities in churches, missions around the world and through his kindness to anyone he met. He was selfless with his time and resources, and obtained limitless energy from helping others. His entire life was spent receiving orders, from both his country and his Lord, and then working diligently to fulfil the mission. Mission accomplished. He was preceded in death by both his parents and eldest sister. He is survived by five siblings, his loving and devoted wife of 58 years, Dorothy, his four children, Charles (Kathleen), David (Liza), Arletta (Gary) and Jon (Michelle), 13 grandchildren and four great grandchildren. Visitation will be Monday evening, September 21, 2015 at Langsford Funeral Home in Lee’s Summit, MO, from 6:00-8:00 P.M. The” Graduation to Glory” celebration will be held at Belton Assembly of God Church in Belton, MO, Tuesday, September 22, 2015 at 10:00 A.M., followed by burial in the Belton Cemetery. In lieu of flowers, the family suggests donations to: Belton Assembly of God Missions Fund, Gospel Literature International, Serenity Hospice or Summit Christian Academy. Arrangements by Langsford Funeral Home, Lee’s Summit, MO. 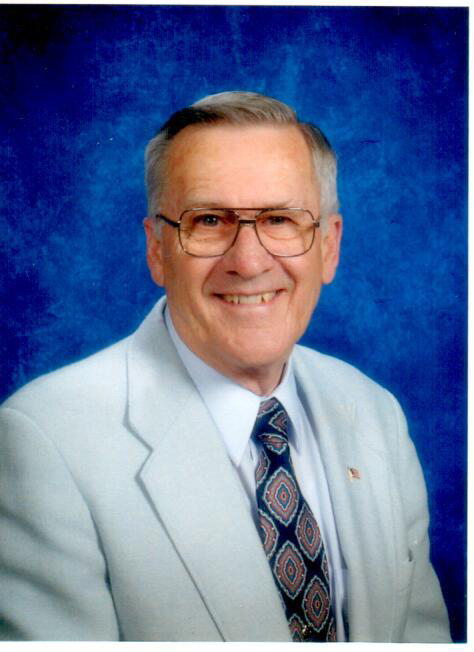 Walter Stanley Kowalewich, 87, of Raymore, MO passed away June 28, 2015. Graveside will be 10 AM Wednesday, July 1, 2015 at the Missouri State Veterans Cemetery in Higginsville, MO. In lieu of flowers, memorial contributions may be made to Kansas City Hospice & Palliative Care 9221 Ward Pkwy Ste. 100 Kansas City, MO 64114-9808. Walter was born October 24, 1927 in Granite City, Illinois, the son of Kazmer and Stasha (Sebolesky) Kowalewich. Walter was preceded in death by his parents; sister, Arlene Haldeman and brother, Stanley Kowalewich. He is survived by his wife Betty of 67 years; son, Stephen Kowalewich and wife Caroline; daughter, Barbara Jean Songer and husband Vernon; sister, Wanda Hiestand; four grandchildren and seven great-grandchildren. Walter is a present member of the Lee’s Summit American Legion Post 189 and a past member of the American Legion Honor Guard of Kimberling City, MO. Walter was the President of the Painters Local 203 for 15 years. 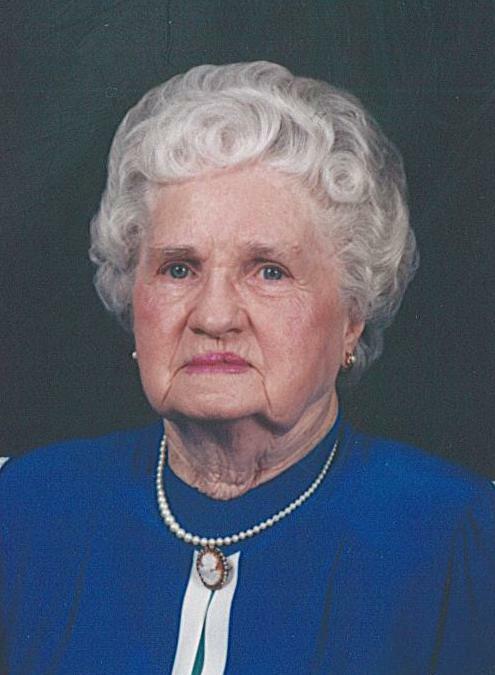 Betty Jean (Arnold) Johnston, lifelong resident of Raymore, MO, died Friday, June 19, 2015. Betty Jean was born May 31, 1927 to Willis A. Arnold and Myrtle E. (Stultz) Arnold. Growing up in Raymore, her family owned a dairy farm and Betty would help deliver the milk to customers around town. Betty attended Raymore High School where in 1940 she met her future husband, R. G. Johnston. Betty was a good student, especially with numbers. She graduated in May of 1945. When R. G. returned home after his discharge from the Army, they were married on June 21, 1947. They had $50 when they got married and lived in an apartment over a church in Raymore. He worked at Montgomery Ward in Kansas City and Betty found a job at an auto parts distributor in Kansas City. She did the bookkeeping, helped customers, answered the phone, and anything else that needed to be done. So in the early 1970’s when the owner one day decided to sell the business Betty told R.G. on the ride home that night, that “after supper they needed to talk”. That talk resulted in her buying the business, but not running it from its original location. She decided to run it from her home. So every morning she loaded merchandise into a van and drove to various automotive places around Cass and adjoining counties. She basically went door-to-door providing parts and other supplies to stations and auto repair businesses. Her idea was a success. Years later when R.G. retired from Montgomery Ward, they bought a second van. The business flourished until about 2001 when they decided to sell out and retire. Betty was preceded in death by her husband of 66 years and her sister Louise S. (Arnold) Hoback. She is survived by a niece Barbara J. Hoback Leblank and her partner John Miele of Woodland Hills, CA, a niece Arnetta K. Johnston, of Belton, MO, and three nephews, Michael W. Johnston and his wife Colleen of Belton, Philip D. Johnston and his wife Carol of Harrisonville, and Richard G. Johnston and his wife Natalie Johnston of Belton, along with six great nieces and nephews and twelve great-great nieces and nephews. Visitation and remembrance will be Monday, June 29th from 6 – 8 pm at Cullen Funeral Home 612 W. Foxwood Dr., Raymore, Missouri 64083. In lieu of flowers, the family requests that contributions be made to: The American Lung Association 1118 Hampton Ave., St. Louis, Missouri 63139-3196 or The Raymore Historical Society PO Box 1483 Raymore, Missouri 64083. 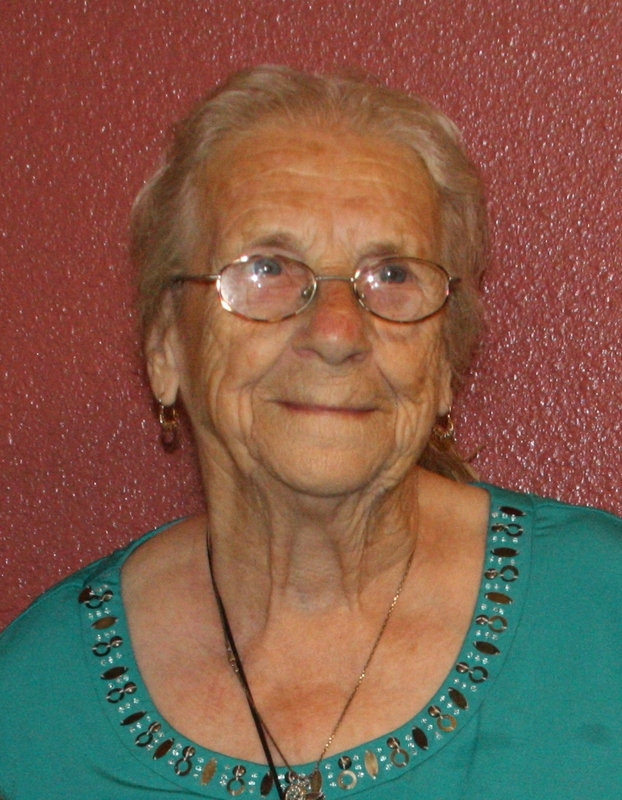 Erma Irene (Carter) Bates, 88, passed away June 11, 2015 at Foxwood Springs Living Center, Raymore, Missouri. Memorial services are 1:30 pm Sunday, June 14, 2015 at Bromwell Lounge in Foxwood Springs Living Center. Graveside services are 10:00 am Monday, June 15, 2015 in the Prairie Ridge Christian Union Church Cemetery. In lieu of flowers, memorial contributions may be made to Brookdale Hospice 1500 W Foxwood Dr, Raymore, MO 64083 or Meadowbrook United Methodist Church 2800 NE 64th St, Gladstone, MO 64119. Erma Irene was born January 30, 1927 at the family home in Dockery, Missouri. She was the eleventh child of eleven children born to Joseph Howard Carter and Volena Belle (Rippy) Carter. Erma grew up northeast of Kansas City, Missouri living in several small Ray County communities calling Polo her hometown and Prairie Ridge Church her community. She graduated from Polo High School in 1945. Following graduation, she moved to Kansas City. She signed on with Kansas City Life Insurance early in her career and worked her way up becoming a respected underwriter for the company, retiring in the early 1980’s. Erma’s life in the city began when she and her sister, Fern, moved in with friends and found jobs. She enjoyed the city and was involved in many activities. She was a member of the Linwood Methodist Church where she and Fern became members of the Criterion Group keeping close ties with many after leaving Linwood Methodist. Erma also liked to square dance. That is where she met Jack Bates whom she later married on March 24, 1973. She and Jack were active members of Meadowbrook United Methodist Church where she sang in the choir and helped with many church functions. They also enjoyed traveling. They pulled their camper throughout the United States and Canada wintering for many years in south Texas. 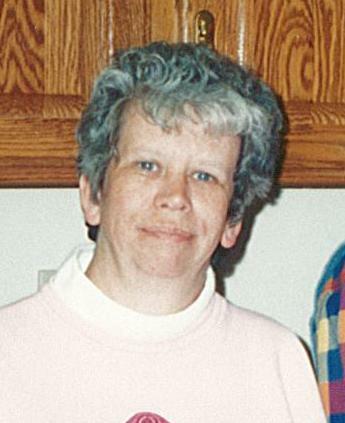 After Jack passed away in 2007, Erma soon moved to Foxwood Springs. She again became involved in her community becoming good friends with many of the residents and staff. She loved her family and was the catalyst of many family gatherings–especially if out of town family members were visiting. Those preceding her in death were: her husband; her parents; brothers, James, Melvin, Maurice and Wallace Carter; sisters, Helen Karr, Vera Dooley, Virginia Schmidt, Willa Belle Coffman and Fern Charlesworth. Survivors include her brother Doris Carter (Imogene) of Polo; many nieces and nephews, their families, which include many great and great-great nieces and nephews. Erma especially loved the little ones. 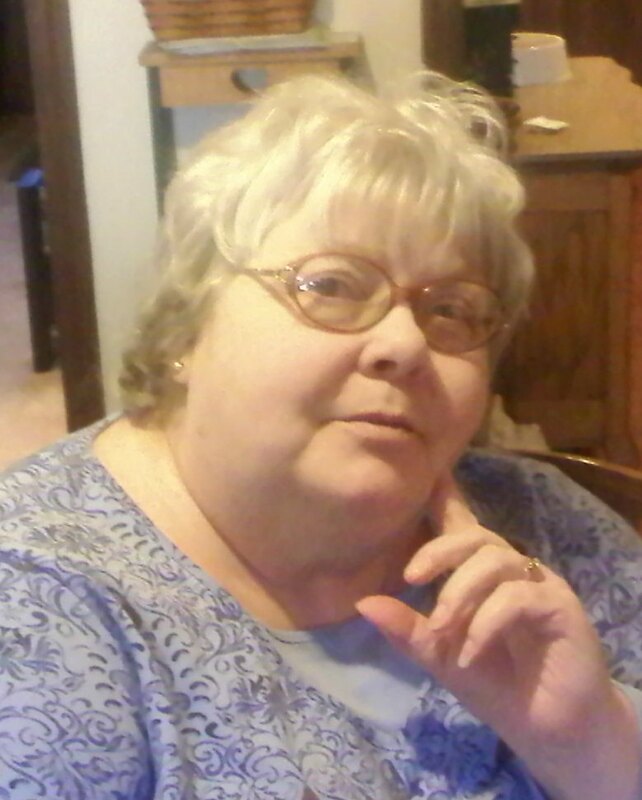 Mary Kathryn “Kay” Little of Raymore, Missouri departed this life early Sunday Morning on June 7, 2015 from natural causes. She passed peacefully in her sleep. Kay was born of Claire Lewis Glenn and Coley Lee Glenn Jr. on October 5, 1946. She was born in LaGrange Georgia, but spent most of her youth in Tampa, Florida where she enjoyed the warm weather and learned her appreciation for being close to the water. Kay’s family moved to Overland Park, Kansas when she was entering college. She attended Baker University before meeting her husband George Little. She and George married in July, 1966, and lived in Independence Missouri for several years before finding a beautiful 2 acre property in Raymore, Missouri. They built their family home on that property, raised their son Joel Little, and owned it until 2014. Kay and George started a business, Midwest Fire and Safety, in 1984 where she was the office manager. To get away from the long hours of owning a business, they purchased a place at the Lake of the Ozarks which became a cherished family retreat and reunited her once again with the water. Kay was known for her spunky personality, and always having an opinion to share. She loved the small town environment, especially being involved in the Raymore Community. Kay enjoyed listening and visiting with friends, as she always had a fun story to share. She was known to be the happiest at the Lake of the Ozarks, surrounded by her friends and family, especially her 2 grandkids Aaron and Kinley. She is survived by her brother Coley “Lee” Glenn of Shawnee, Kansas and her sister Ida Ward of St Joseph, Missouri, son Joel Little, daughter in law Kimberly Little, grandson Aaron Little and granddaughter Kinley Little of Lee’s Summit, Missouri along with other relatives and many friends. Family is hosting a Celebration of Life on Sunday, June 14th, from 1:00pm to 4:00pm in the home of her son, Joel Little, 2509 NE Spring Creek Dr, Lees Summit, Missouri 64086. 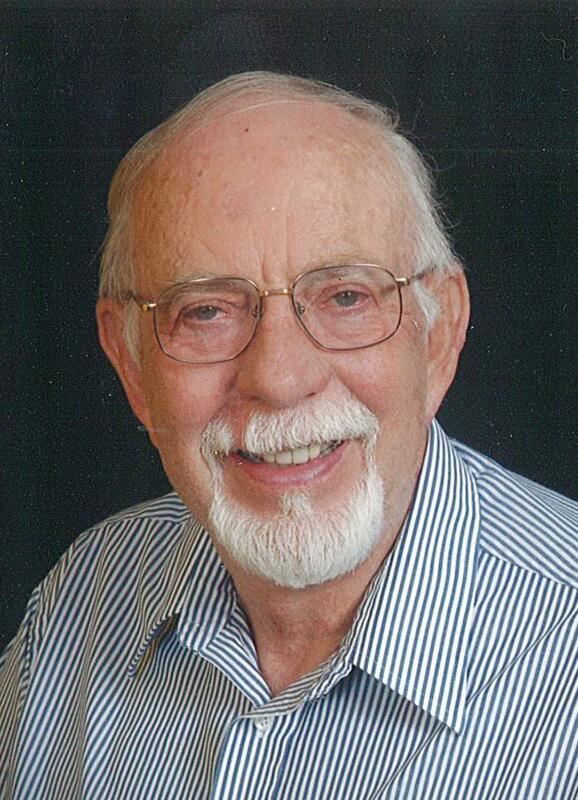 Willi Fritz Richard Senst, 80, of Raymore, MO passed away May 27, 2015 with his family by his side. Memorial Mass will be 10 AM Thursday, June 4, 2015 at Holy Spirit Catholic Church, Lee’s Summit, MO with visitation 9-10 AM. Memorial contributions may be made to the Church or Olathe Hospice House – online: https://www.olathehealth.org/Donations#.VWcAa3J_nop. 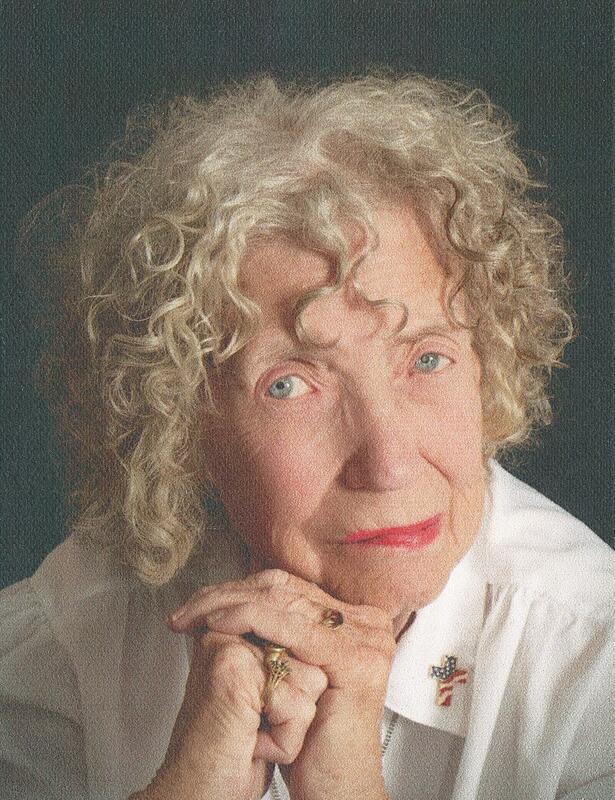 Elizabeth Louise (Clark) Latenser died peacefully at home in Overland Park, Kansas on Friday, May 29, 2015. Bette was born on Aug. 2, 1924 in Atchison, Kansas to Joseph Francis and Martha Hudgins Clark. She spent her childhood in Atchison, where she married Russell Edward Latenser on Jan. 23, 1946. Bette was an adventurous, accomplished, generous, creative, and vivacious woman. She enthusiastically embraced travel and the opportunity to immerse herself and her family in each new posting to which Russell’s military assignments brought them: Fort Leonard Wood, Missouri; Heidelberg, Germany; Fort McClellan, Alabama; Hanau, Germany; Redstone Arsenal, Alabama; Fort Hood, Texas; settling in Albuquerque, New Mexico for eventual retirement; and then returning to Overland Park, Kansas in her last years. She began her career as a clerk for the Missouri Pacific Railroad, and concluded as executive secretary to the Navy admirals and Army and Air Force generals who commanded the Defense Nuclear Agency at Kirtland Air Force Base, Albuquerque, New Mexico. Her powerful persona, liberally laced with humor, was a driving force in the completion of many complex and time-sensitive agency programs. Her accomplishments were wide and varied. Bette won New Mexico State Fair blue ribbons for her hand-sewn christening gowns, a beaded wedding dress and clothing she created on her knitting machines. Bette danced her way through life to big band music and square dance calls. She traveled with gusto, welcomed new friends of many nationalities with a beaming smile, and opened her home to world travelers. She and Russell folded many young people into their hearts, making them a part of the family. Bette’s eclectic life led her to learn to truly appreciate wine in Germany, and to travel independently to Paris, France and Berlin, Germany. She, builder of community, rallied friends and neighbors to come together to joyfully celebrate small or large occasions, or to celebrate for no occasion, at all. Bette maintained her life-long love of high-heeled shoes, which she wore beyond her 90th birthday. For her 1959 voyage home to the United States from Heidelberg, Germany, Bette was set to pack 28 pairs of high-heeled shoes for a 7-day passage. Shocked at the mounds of shoe boxes, Russell suggested she pack fewer, so she packed only 14 pairs! High-heeled shoes: emblem of her unique self. Bette was a devout Catholic her entire life. Every week, for years, she baked bread and delivered it, warm and fragrant, to the waiting butter knives of the retired nuns of Saint Bernadette’s Church. Bette is survived by her loving children, Mary Jean Brown (John), Petie Walker, Rusty Latenser (Tina), Philip Latenser (Davene); her granddaughters Stephanie Crane (Bob), Mary Beth Brown (Matt), Lauri Quigley (Michael), Summer Baxter, Misty Reece, and Summer Smith (David); 11 great-grandchildren Luke, Avery and Hannah Crane, Justin and Will Quigley, Bryson Baxter, Johah, Lydia and Elijah Reece; and Delilah and Kaine Smith. Also surviving is her cherished sister, Janice DeGisi (Sabino); many nieces and nephews; her first cousins Toots Celano, Mary Arensberg, Larry Clark, Pat Boos, Judy Miller, Mary Ann Weaver, Clark Morin, Dixie Barnhart, Ken Whipple, Julia Clem and Kathy Tyson; and other family members. She leaves behind many friends, whom she held close in her heart. Bette is preceded in death by Laurie Elizabeth, daughter; Martha and Joseph Clark, Bette’s parents; and by Joseph, Michael, Thomas and Richard, Bette’s brothers; and, recently, John E. Latenser, Bette’s brother-in-law. Bette will be buried in Santa Fe National Cemetery in Sante Fe, New Mexico, with her beloved husband, Russell, who died July 10, 1995. There will be a visitation at Porter Funeral Home, 8535 Monrovia, Lenexa, KS 66215, on Friday, June 5, 2015 from 5 to 7 p.m., with Rosary at 5 p.m. Her funeral Mass of Christian Burial will be held at Holy Spirit Catholic Church, 11300 W 103rd St., Overland Park, KS 66214 on Saturday, June 6, 2015 at 10 a.m. Interment will be at the Santa Fe National Cemetery in Santa Fe, New Mexico. Online condolences may be made at www.CullenFuneralHome.com. In lieu of flowers, Bette asks that you perform an act of kindness, hug someone you love or call a long-missed friend. Bette’s family offers our deep and warmest gratitude to the kind and loving caregivers at SeniorCare Homes who added joy to our mother’s life, and who enriched her life and ours. Thank you to Grace Hospice and Interim HealthCare. After a noble struggle with cancer, the matriarch of our family, Helen Mae “Mimi” Roberts passed away on the morning of May 25th, 2015. She is remembered and respected for raising three children on her own at the age of 28 (without even knowing how to drive), on a secretary’s salary and eventually working her way up to the role of a manager. No matter how her day went, she never seemed to be in a bad mood which she displayed through her immense love for her family. She spoiled her grandchildren whenever possible, surprising them with snacks, candy, books and other gifts. In her free time, she watched John Wayne movies, read Danielle Steele books, and listened to Elvis Presley records; she loved The King nearly as much as she loved her family. Her love of family and friends extended across the ocean to her pen pal, Pat Richardson of 64 years. After a writing assignment in elementary school, they remained friends and visited each other several times. Her family will miss her excessive decorations for any and all holidays, her unique ability to unsuccessfully grow any plants, shopping with her at garage sales every weekend, and her collection of shoes that would rival that of Imelda Marcos. She was the daughter of Charlotte Taylor who preceded her in death along with her older brother Richard Taylor. She is survived by husband Harry P. Roberts, daughters Lynn Schmidt (Phil), Lori Samazin (Steve), and son Brad Jackson (Susan). She is also survived by her sister Judy Dixon (Phil), brothers Robert Taylor and Ron Taylor (Sarah). She leaves behind spoiled grandchildren Dustin Schmidt (Juliana), Jordan Schmidt (Crystal), Aaron Schmidt (Sarah), Sarah Schmidt, Alexandra Samazin, Adam Samazin, Haley Jackson, and Emily Jackson. Not to be forgotten and just as spoiled are her five great grandchildren and numerous nieces and nephews. In lieu of flowers, the family requests donations to the University of Kansas Cancer Center, 3901 Rainbow Blvd., Kansas City, Kansas 66160. A celebration of life will take place on Friday, May 29th from 4:00 – 6:00 pm at the Cullen Funeral home located at 612 W. Foxwood Drive in Raymore, Mo. We love you Mimi. A bushel and a peck and a hug around the neck. 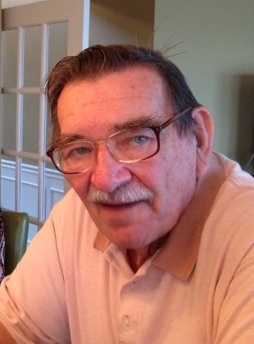 Marvin L. McWilliams, 81, of Raymore, MO passed away May 4, 2015 at Foxwood Springs Living Center. Memorial service will be 7 PM Thursday, May 7, 2015 at Cullen Funeral Home with visitation 6-7 PM. In lieu of flowers, memorials may be made to Alzheimer’s Association 3846 W 75th St, Prairie Village, KS 66208. Marvin served his country in the United Stated Army. He retired from Amoco and was a member of the Pipefitters union. The final years of his career he enjoyed being a welder and became the manager of the welding shop. His life was guided by his faith as member and deacon minister of East Main Baptist Church in El Dorado Arkansas, Noland Road Baptist Church in Independence, Mo and First Baptist Church in Texas City TX. 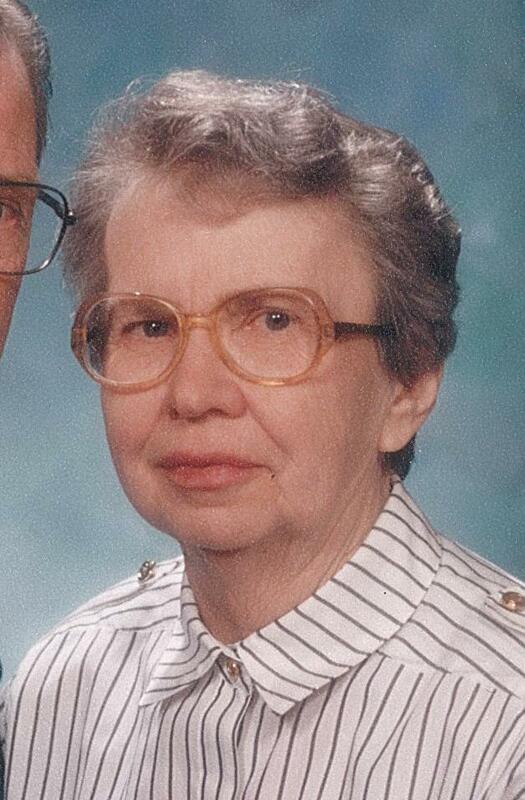 Ione Barbara Schnell, 82, of Raymore, MO entered into heaven on April 10, 2015. Memorial service will be 2 PM Tuesday, April 14, 2015 at Lord of Love Lutheran Church 8306 E 171st St, Belton, MO 64012 with visitation 1:30-2 PM. 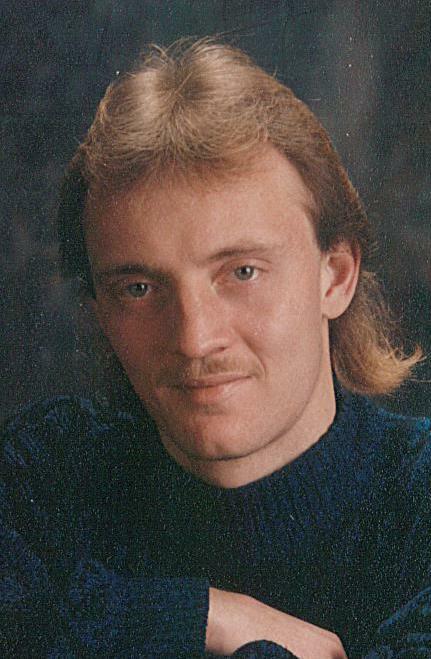 In lieu of flowers, memorial contributions may be made to the Lord of Love Lutheran Church. Ione was born December 15, 1932 in Stoughton, Wisconsin, the daughter of Tillman and Bernice H. Roum Dahl. Ione was preceded in death by her parents and sister, Margaret Hammond. She was dearly loved by family and friends. She is survived by her loving husband Dennis N. Schnell of 63 years, (the two of them were the perfect example of love and respect). She also is survived by her son, Dennis T. Schnell and wife Mari; daughter, Melinda S. Cetto and husband Jeff; sister, Susan Balthazor and husband Michael; 2 grandchildren, Nathan C. Schnell and wife Kasi and Audrey L. Cetto; and many very dear friends. Ione (Mom) was special in so many ways, and loved so many things that made her life whole. She had a deep religious faith that was the foundation for her life. Family and close friends will miss her so much, but take peace in knowing that she is in heaven watching down on them. Her love for music was strong. 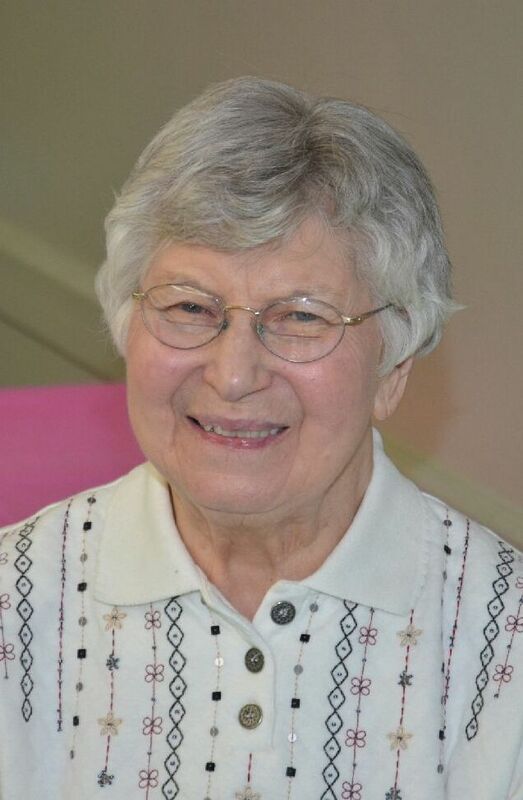 She was the organist at Lord of Love Lutheran church for 38 years, and found great joy in taking part in providing such an important part of the worship service. She also had a deep love for classical music. She had an extremely tender heart when it came to any living creature (except worms). She is legendary in her efforts to save spiders. She would gently scoop them up and put them in a safe spot. Another notable effort was one fall that she saw a wasp slowing down due to the cold weather. She took the wasp in for the winter, took care of it, and released it in spring. She was truly a tender heart that could not stand to see anything suffer. Her love for dogs and cats was enormous. She always had dogs and cats. She would love them like they were her children, and spoil them as only she could do. It gave her much joy. She was a very talented seamstress, and made countless pieces of clothing and outfits that were exceptional, and she was also very talented in designing and making stuffed animals. She loved to bake and always had a wide variety of cookies, cakes, cupcakes, and pie readily available at all times. She also loved her flowers and trees very much. She would work tirelessly planting and watering. She truly appreciated the beauty God’s creation of nature. Verna Deane (Park) Elleman, 75, of Raymore, MO passed away March 25, 2015, at KU Medical Center, with her family by her side. Verna was a beloved wife, mother and grandmother. Her sense of humor and caring way endeared everyone to her. Her hugs were powerful and her words of wisdom empowering. Verna enjoyed music concerts, sharing new food experiences with Don and watching/hearing about the accomplishments of her kids and grandkids. She is survived by her husband of 54 years, Don Elleman of Raymore, MO; her children Chris Elleman and wife Bridget of Raymore, MO; Curt Elleman and wife Tamara of Overland Park, KS; Erika Clark and husband Patrick of Raymore, MO and five adored grandchildren; Anthony (Tony), MacKinley, Alexandra Jo(AJ), Wagner and Charleston (Charli). She was preceded in death by her parents; and one brother, Garry Park. 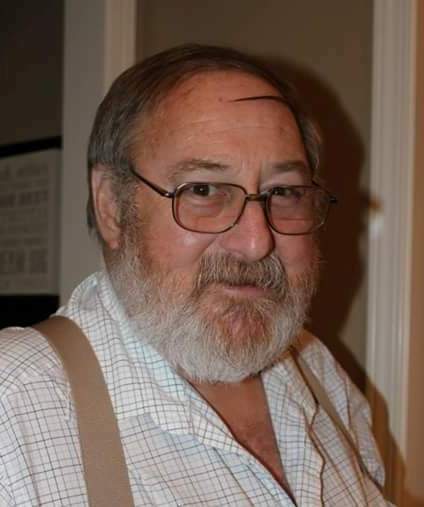 Willard Lester Corlew, 73, of Raymore, MO died March 9, 2015. Visitation 1-2 pm, memorial service 2:00 pm Friday, March 13 at McGilley & George Funeral Home 611 Chestnut in Belton. Burial in Raymore Cemetery. Contributions are suggested to the Willard Corlew Memorial Fund, PO Box 182, Belton MO 64012. Willard was born October 22, 1941 in Blue Springs, MO to Willard and Olive Bullard Corlew. He was a lifelong area resident and a member of The Sabbath Keepers. Willard ran a Lawn Care service. He loved gardening, canning foods and enjoyed family and friends. Evelyn Elizabeth Bateman was born in Los Angeles California on February 21st 1914 the first child of Eugene and Elizabeth Devine. Three years later a brother, Everett was born to complete the family. When she was about six years of age the family moved to Shafter California. Her Mother was a school teacher so education was important to her from a very young age. She excelled in her school work throughout high school and college. She was a gifted musician playing the saxophone, cello, violin, mandolin, ukulele and she strived to master the piano. She received her Associate of Arts degree from Bakersfield Junior College in 1935 and went on to earn her Bachelor of Arts degree in 1939 from Fresno State College. She achieved her Master’s of Science in Education from Central Missouri State College. As a child and through her teen years her jobs included picking cotton, gathering potatoes, snack food server and youth minister. She received ministerial ordination from the Pentecostal Church of God in 1942. She, along with Morene Holloman, were lady evangelists for several years and then pastored a church in Findlay Ohio. In 1953 she became Director of Christian Education for the Pentecostal Church of God and served that position until 1956. From 1958 until retirement in 1978 she taught special needs students in the Hickman Mills School District. She received a national honor as “Teacher of the Year” in 1972. She met an evangelist, Wayne Bateman in 1955 and they married in 1960. They later pastored Faith Tabernacle Church in Martin City Missouri and Word of Life Church in Louisburg Kansas. Although both of them retired they continued to preach, teach, pastor and extend Christ’s love to whomever they encountered. They moved to Foxwood Springs about 24 years ago. Wayne preceded her in death five years ago and she went into the presence of the Lord on March 6th 2015 at the age of 101. Her mother, father and brother Everett have also previously gone to their rewards in heaven. One daughter, Sharon has also preceded her and she is survived by two sons: Jimmie (Jake) Bateman of Selah Washington, Gaylen Bateman and wife Margaret of Benton City Washington and two daughters: Waynette Cubberly and husband James of Naches Washington and Sue Smith of Battleground Washington. She also has twelve grandchildren, nine great grandchildren and two great great grandchildren. She is adored by three nephews: Patrick Devine, Steven Devine and Mark Devine. A memorial service will be held at Foxwood Springs on Thursday March 12th at 11:00 AM followed by graveside services at Raymore Cemetery at 1:00 PM. The Rev Don Ogden will be officiating and the Cullen Funeral Home is making arrangements. In lieu of flowers memorial contributions will be received for Prisoner’s Web Ministry. Frances Catherine Swaffar (93), “Omar, Omie, Fran” sweetly and very peacefully left us for heaven on February 19, 2015, at Foxwood Springs, Raymore, MO. Francis Catherine Farris was born November, 27, 1921, in Linn Creek, to Ellen Catherine Farris and Thomas Jefferson Farris. She married Ersmond Swaffar May 13, 1942 in Jefferson City, MO. 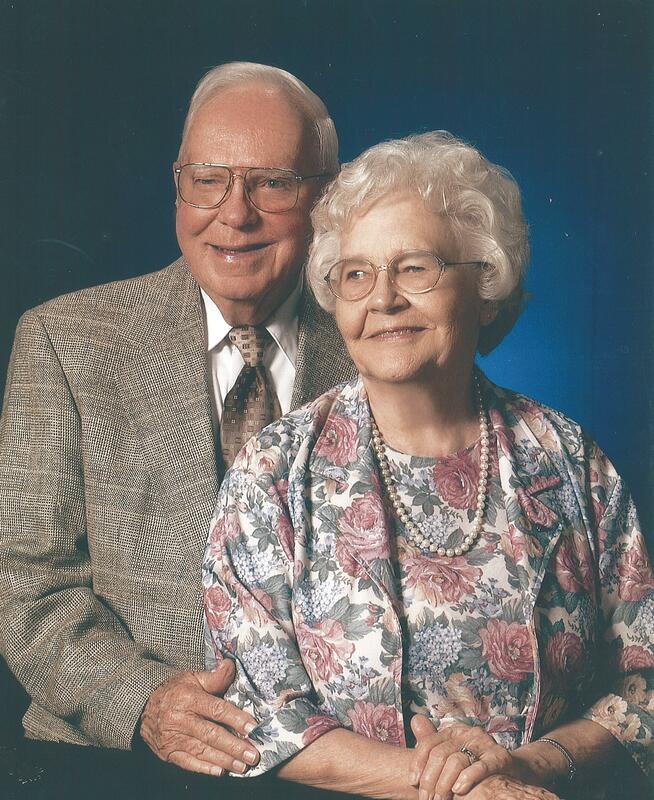 Their precious relationship took them from William Jewel College to the pastorate, to military life as a chaplain with the United States Air Force and retirement to a farm near Stella, MO, until Ersmond passed away in 1980. 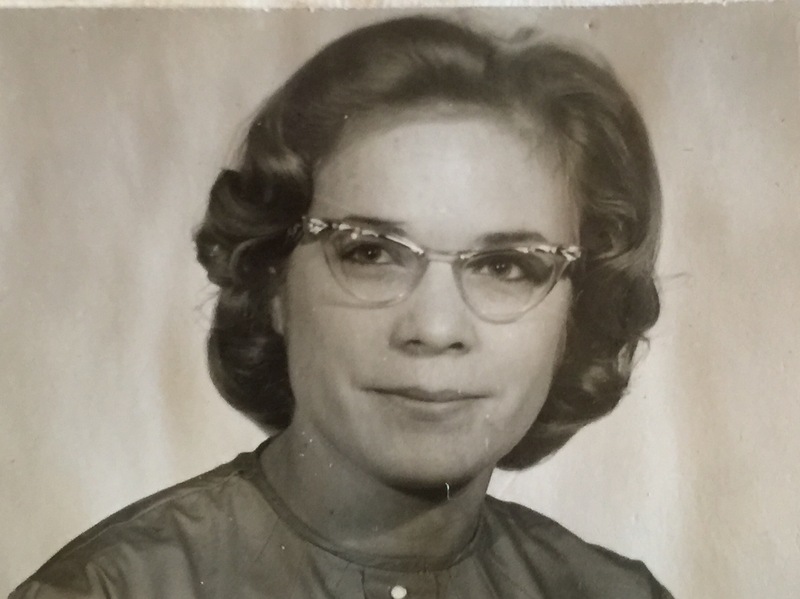 Fran lived for 1 0 years in Belton and 22 years at Foxwood Springs, Raymore, MO, where she made many friends, pursued her life-long love of reading and crafts.Fran inherited perseverance from her mother and a zest for life from her Missouri River-Boat pilot father. She loved her children, grandchildren, great-grandchildren, all family and friends. Her creativity included ceramics, painting, quilts and knitting. Special memories include the personal afghans made with love. She often taught crafts wherever she lived and after the children where grown and before moving to the farm she was assistant editor of The Work Basket craft magazine in Kansas City.She is survived by four of her six children: Tom Swaffar (Sheila), Cathy Pound, (Carol Swaffar), Suzy Cassil (Les), and Ellen Berry (Ralph). Grandchildren: Cynthia Martin (Doug), Tom Pound (Tracy), Christy Gordon, Dan Pound (Brittany), Sean Berry (Darcie McDonald), David Pound (Niki), Ben Cassil (Mandy), Zack Cassil. Great-grandchildren: Liz Pound, Maddison Martin, Olivia Pound, Morgan Martin, Ella Pound, Mason McDonald, Abby Gordon, Landen Pound, Lucas Gordon, Gavin Pound, Cadence Pound, Cameron Pound, Mason Pound, Sawyer McDonald-Berry, Swayzie McDonald-Berry, Hudson Pound. She was preceded in death by her husband Ersmond “Jack” Swaffar, one daughter Alice Ann Swaffar, and one son Richard Farris Swaffar and son-in-law Jeff Pound.The family will receive friends prior to the service at the funeral home from 9 am until service time 10 am, on Saturday, February 28, 2015, Clark Chapel of Memories, Neosho, MO. Interment will follow at Macedonia Cemetery, Stella, MO.A Memorial Service will be held on Monday, March 2, 2015, 10 am at Foxwood Springs, Raymore, MO.The family wishes to express a “Special” thanks to all her amazing care givers. 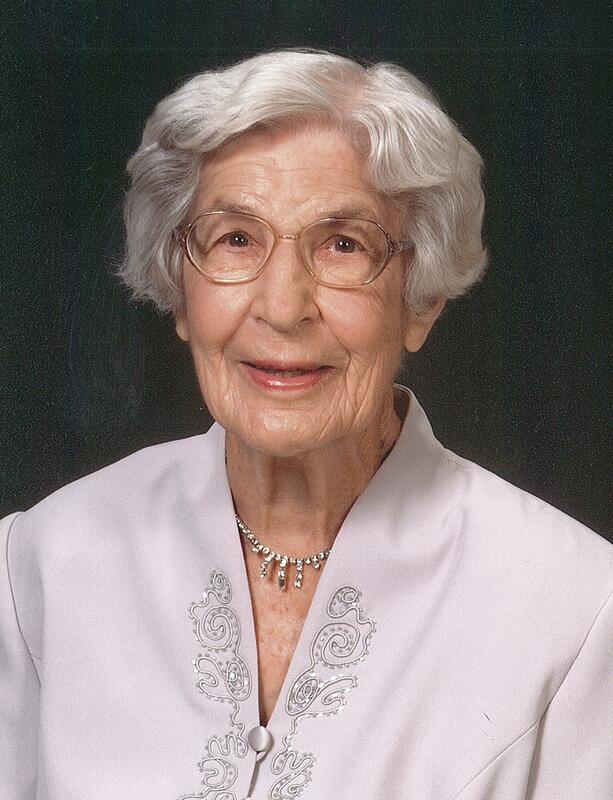 Willia E. Kenagy, 104, of Raymore, Missouri, passed away February 21, 2015 at Foxwood Springs Living Center. Willia was born on October 23, 1910 in Gunn City, Missouri, the daughter of Thomas W. and Nellie Gray Dean. She was one of 10 children. During her life she enjoyed cooking for and entertaining her family and friends. She was a member of the Raymore Christian Church and baptized in her youth. Willia was preceded in death by her husband, William H. Kenagy, Sr.; six sisters, Merle Mott, Faye Henry, Maryvina Stewart; Esther Plank, Eula Mae Franklin and Margie Gragert; brother, Earl Dean; son, William H. Kenagy, Jr.; daughter-in-law, Emily P. Kenagy and granddaughter, Elizabeth Lea Kenagy. She is survived by her son, Robert A. Kenagy and wife Lindy of Ozark; two brothers, JT and Bearl Dean; daughter-in-law, Julia Kenagy; seven grandchildren, Robert D., Ryan, William H. III, Trevor, Deborah, Rebecca, Elizabeth; 13 great grandchildren; six great great grandchildren and many nieces, nephews, and special friends. Visitation will be Wednesday, February 25, 2015 at noon at the Cullen Funeral Home with the funeral service to follow at 1:00 pm and burial in the Raymore Cemetery. In lieu of flowers, memorial contributions may be made to The Fellowship of John at Foxwood Springs 1500 W. Foxwood Drive, Raymore, Missouri 64083 or the Alzheimer’s Association 3846 West 75th Street, Prairie Village, KS 66208. Alice Gabrielle Walsh, daughter of Francis Menard and Eliane (Roy) Menard, was born on July 10, 1941 in Ottawa, Ontario Canada. It was here that she met and married her first husband, Charles Johnston and began their family. In 1962, they moved to Belton, Mo. She spent most of the next 18 years residing in Peculiar, Mo., before their family was transferred to Little Rock Air Force Base in Arkansas. Shortly after in 1981, the family retired back to Seligman, Mo. Alice was truly a loving Mother, wonderful friend and caring wife. She enjoyed reading, crossword puzzles, spending time with her family and spoiling everyone. She entered into rest on Tuesday, February 10, 2015 at her home in Branson, Mo. She was 73 years young. Alice was preceded in death by her parents, her brother, Maurice Menard and her sister, Denise Martel. She is survived by her son Robert Johnston and wife Debra of Branson: two daughters; Catherine German and husband Randy of Raymore, Mo., and Susan Fletcher and husband Allen of Jericho Springs, Mo. ; six grandchildren and four great grandchildren. A celebration of life will be held March 8 in Branson. Please contact the family for details. Arrangements were under the direction of Snapp-Bearden Funderal Home Branson, Mo. 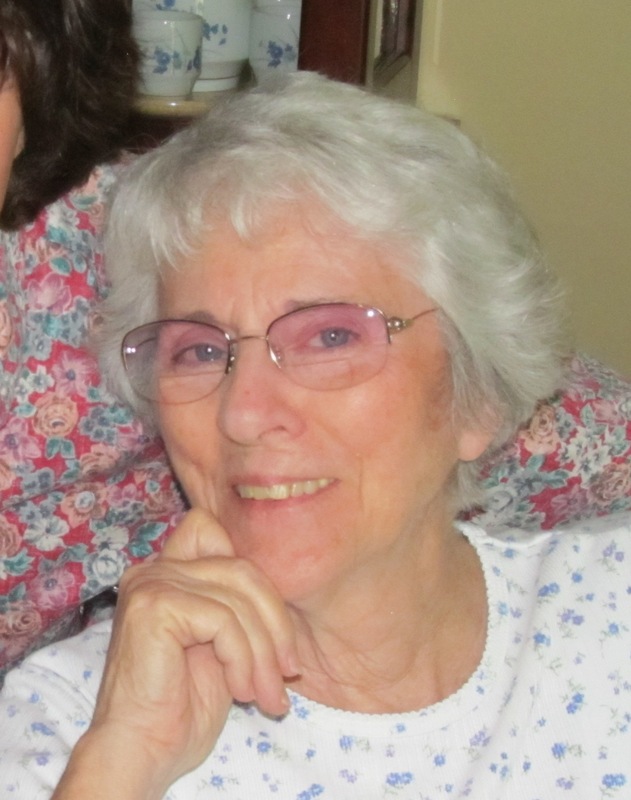 Geneva A. Hopkins, 74, of Raymore, MO passed February 14, 2015. Funeral service will be 3 PM Thursday, February 19, 2015 at Raymore Assembly of God 118 West Walnu t Street, Raymore, MO 64083 with visitation 1-3 PM. Burial will be in Belton Cemetery. In lieu of flowers, memorial contributions may be made to Smile Train, an international children’s charity committed to helping children born with cleft lip and palate. Geneva was born February 12, 1941 in Marysville, California, the daughter of Major and Ruth Mabray Henshaw. Geneva was preceded in death by her parents; two sisters, Pauline Taylor and Betty Clay; and brother, Ervin Henshaw. She is survived by her husband of 54 years, Alvin B. Hopkins; son, Doug Hopkins and wife Pam; daughter, Cindy Hopkins; and two grandsons, Reis and Ryan Hopkins. Geneva spent 22 years serving as a teacher’s assistant for the Rio Linda (CA) School District working with elementary age children and the Head Start program. In addition, she spent several years working at Montgomery Wards in Sacramento, CA helping put her own children through college. After retiring, Geneva moved to Willard, MO in 1999 where she worked in multiple service projects including the food pantry at her church. Geneva enjoyed camping and participated in several domestic missions’ projects through the Missions and Placement Services (MAPS) program of the Assemblies of God. In 2011, Geneva moved to Raymore, MO where she lived until her passing. She was a member of the Raymore Assembly of God church and supported various ministries at the church as well as the ministry of various relief agencies such as Voice of the Martyrs. Violet L. (Archer) Lane, Hoenshell, was born March 21, 1928, in Excelsior Springs , MO and was a lifelong resident of Missouri . The daughter of Ivan and Lena Archer, Violet married Dwight Lane in 1948 and had two daughters, Sandra and Sharon. After only 6 short years, Dwight passed away from cancer. In 1956, she married Howard W. Hoenshell and gave birth to four more children: Wayne, Warren, Carol and Gary. For the next 37 years they spent their time raising six children on a farm in Raymore , MO until Howard’s death in 1993. As a young woman Violet had worked for the phone company. After the birth of her children she dedicated herself to her family. Violet did enjoy working at Week’s Walnut Farm on a seasonal basis. In 1975, she re-entered the work force utilizing her remarkable sewing skills at Lovell Custom Draperies in Kansas City . After 12 years at Lovell’s she took a position with Mary’s Custom Draperies in Peculiar. Violet spent the next 28 years at Mary’s, with the exception of 3 years spent caring for her mother and great-grandchildren. Over the course of her time employed at Mary’s she expanded her sewing skills and forged a deep friendship with Mary. Violet’s hobbies included crafting with her sister, Velma, and later with her daughters and daughters-in law; reading; and goofing around with her children every chance she got. Violet was preceded in death by her parents Ivan and Lena Archer; husbands, Dwight Lane and Howard Hoenshell; sister, Velma Lane ; son-in-law, Robert Hedges; daughter-in-law, Leslie Hoenshell; grandson, Dustin Hoenshell; and great-grandson, Zachary Hedges. She is survived by 6 children: Sandra Lane Hedges; Sharon Lane Butler and husband, Carl; Wayne Hoenshell and wife, Marie; Warren Hoenshell and wife, Monica; Carol Glidewell and husband, Jim; Gary Hoenshell; 18 grandchildren and 13 great-grandchildren. Charles Robert Johnston was born July 9, 1936 in Iowa City, Iowa. He was the son of Charles R. Johnston and Virginia (Repp) Johnston. He attended Southwest High School in Washburn, Missouri. Charles served in the United States Air Force from 1954 to 1980. He retired as a Master Sergea nt from the Little Rock Air Force Base. After retirement, Charles lived in Seligman, MO. He was a member of the First Baptist Church of Seligman. 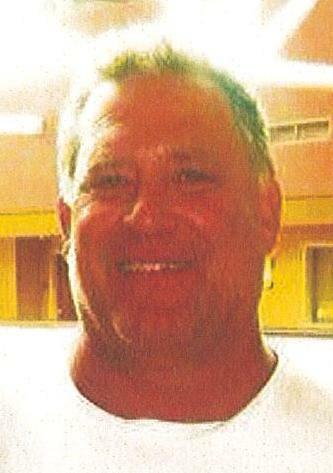 He was an outdoorsman and enjoyed golf and fishing. He was also a coin collector. Charles had moved to Branson to be closer to his family. He entered into rest on Monday, January 26 at Pt. Lookout Nursing & Rehab. He was 78 years old. Charles was preceded in death by his parents and one brother, Russell. 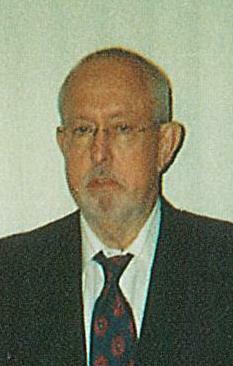 He is survived by his son, Robert Johnston and wife Debra of Branson; two daughters, Catherine German and husband Randy of Raymore, MO, Susan Fletcher and husband Allen of Jericho Springs, MO; one brother, Richard Larimer and wife Kathy of Kansas City, MO; six grandchildren and four great grandchildren. A celebration of life will be held March 8 in Branson, MO. Please contact the family for details. Graveside services will be March 9, 2015 at 10:00 A.M. in the Missouri Veterans Cemetery, Springfield. Arrangements were under the direction of Snapp-Bearden Funeral Home, Branson. Memorials in Charles’ memory may be made to Hope for the Warriors, 5101 C Backlick Rd., Annandale, VA 22003. 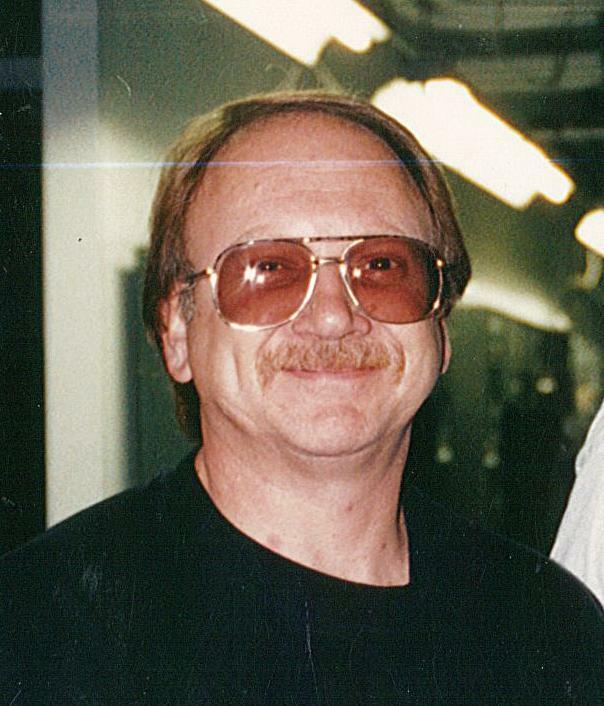 James Edward Ohnemus, 75, of Raymore, Mo., died Jan. 28, 2015, at Research Medical Center in Kansas City, Mo. He suffered complications following an elective surgery on Nov. 6, 2014. Ohnemus, a retired millwright for Honeywell who worked 45 years in the construction industry, was born in Melrose, Iowa, on Jan. 2, 1940. Th e tenth of 11 children, he grew up on a farm near town and at age 6 moved to Des Moines, where he graduated from Dowling High School in 1959. That same year he entered a multiyear sheet metal apprenticeship program there and began work at the Waldinger Corp., first as a sheet metal worker and later as a draftsman. He completed 25 years’ service with Waldinger before the company entered into financial difficulties in 1983. As a journeyman sheet metal worker, he additionally served for two years in the Iowa Army National Guard reserves. Staying in the sheet metal trade, Ohnemus began commuting to Kansas City, Mo., and five years later moved to Raymore. He jumped at an opportunity to work for the Kansas City Honeywell plant in 1992 and worked 13 more years there, retiring in 2005. During his career he worked on construction projects that spanned the globe. Big jobs included HVAC systems for the Superdome in New Orleans, La., hospitals in Saudi Arabia and military bases in the U.S. In his free time, he dedicated himself to many remodeling and building projects for family and friends. A carpenter, master plumber and builder, he took on projects no one else would touch—he poured concrete, installed windows, cut doors into basement walls, and showed his artistic side by designing creative metalwork projects for churches and schools. He once fixed a sagging foundation on his house in Des Moines by jacking up a corner of the basement and adding a missing footer. In 1974, he bought a woodlot in southern Iowa, where he built a cabin near state forest land. A lifelong outdoorsman, who caught the fever to hunt and fish at an early age from his brothers on the farm, Ohnemus had a passion for all number of outdoor pursuits: archery, bicycling, backpacking, canoeing, cross-country skiing, fly fishing and turkey and deer hunting. The year he retired from Honeywell, he took five fishing trips, including a five-week stay in Alaska. Ohnemus was an avid member of the Heart of America Fly Fishers club and the Water Garden Society of Greater Kansas City and he did prison ministry. In 1995, he married Patricia Ann (Steele) Ohnemus, his wife of 19 years who survives him. Also, surviving him are his four children: Edward of Arlington, Va., Therese Crowther of Warrenton, Va., Lori Chatterley of Raton, N.M., and Thomas, of Harrisonville, Mo. He leaves three brothers, Paul of Lacona, Iowa, Leo of Glendale, Ariz. and Carl of West Des Moines, Iowa, and three sisters, Madonna Sisson of Arvada, Colo., Teresa Schaefer of Clive, Iowa, and Margaret Murphy of Altoona, Iowa. One step-son, Russell Davidson, preceded him in death, but he also leaves three step-children from his second marriage: Ronald Davidson of Pensacola, Fla. Dennis Davidson of Russell, Kan., and Laura Davidson of St. Peter, Mo., in addition to five grandchildren and eight step-grandchildren and seven step-great-grandchildren. 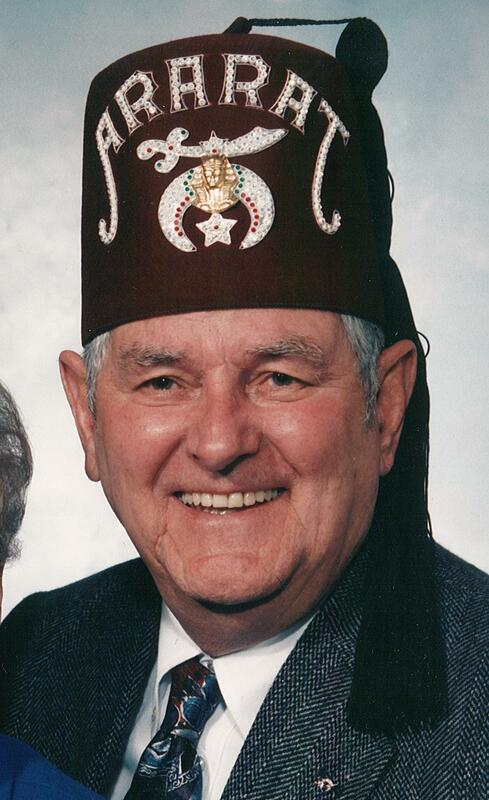 Visitation will be 6 to 8 PM, Monday, Feb. 2, 2015 St. Sabina Catholic Church, 700 Trevis Avenue, Belton, MO 64012 (816) 331-4713. Funeral Mass will be 11:00 AM, Tuesday, Feb. 3, at the church with Rosary at 10:30 AM. Luncheon to follow at the church. Graveside will be Noon, Wednesday, Feb. 4, 2015, Bauer Cemetery, 2207 20th Place, Lacona, IA. The cemetery and church are at the intersection of G76 and 20th Place, 2 miles east of Lacona, Iowa. Repast to follow: Sacred Heart Catholic Church, 204 SW D St, Melcher-Dallas, IA 50163 (641) 947-4981. Billie R. Cooper, 80, Raymore, MO passed away January 23, 2015. Memorial service will be 10:30 AM Wednesday, January 28, 2015 at South Haven Baptist Church with visitation 9:30-10:30 AM. In lieu of flowers, memorial contributions may be made to the Church 16800 Bel- Ray Boulevard, Belton, MO 64012. Billie was born October 10, 1934 in El Dorado, Arkansas, the daughter of Herschel and Christine Blaylock Gardner. Billie was preceded in death by her parents and brother, Jerry Gardner. She is survived by her husband Gary R. Cooper of 62 years; son, Jeff L. Cooper; daughter, Jamye Bordeno (Mitch); sister, Pat Griffith; two grandchildren, Carlee Moore and Cole Cooper; six great grandchildren, William, Darcy, Macen, Corey, Ocean and Sierra. Daniel Loren Johnson, 54 fell asleep in Christ January 10, 2015 at home. Danny was a loving Father and avid fisherman and gardener with the biggest heart. His stories could make you cry he was so funny. He will be deeply missed by his friends and family. Danny is survived by his mother, Joan Johnson; five sisters, Elizabeth Morgan, Carolyn Eib, Janice Morton, Cynthia Bishop and Kathie Rath; two brothers, David Johnson and John Johnson; three daughters, Stephanie Johnson, Cynthia Johnson, Jessica Johnson; one grandson, Aeki; many loving brother and sister-in-laws; nieces, Lauren Johnson, Hannah Rath and Kaytlin Bishop and nephews, Chris Reiter, James Morgan, Phillip Morgan, Jake Bishop, Charlie Morton, Vinny Rath and Andy Rath. He was preceded in death by his father, Kenneth Johnson. Danny worked most of his life as a roofer and in his later years at The Bratton Steel Corporation. He served in the US Army for 2 years. Please make donations to Wayside Waifs as he was a friend to the animals. 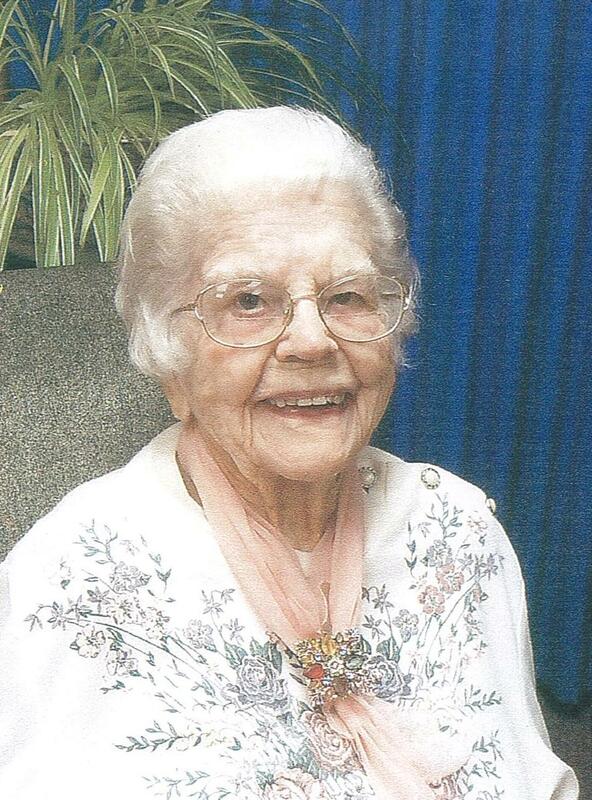 Jane Ingels, 95, of Raymore, MO passed away Tuesday, January 13, 2015. A Celebration of Life will be held from 4-6 PM Saturday, January 17, 2015 at Cullen Funeral Home. In lieu of flowers, memorial contributions may be made to Leanna Christian Church i/c Joyce Allen 2328 Alabama Rd., Chanute, KS 66720. Jane was born August 29, 1919, in Neosho County, Kansas, the daughter of Baulser and Nola Wheatley Breiner. She was a longtime member of Leanna Christian Church, Hickman Mills Community Christian Church where she served as an Elder, and Raymore Christian Church. Jane was preceded in death by her husband, Harry W. Ingels. Harry was the first Principal of Johnson Elementary School, and after his death, Ingels Elementary School was named after him. She was also preceded in death by her brother, Samuel Breiner; and sister, Nina Ruth Ingels. She is survived by her two sons, Harry W. Ingels, Jr. and wife Delana, and Gregory C. Ingels; six grandchildren, John, Andrew, Daniel, Jennifer, Kelli and Kyle; ten great grandchildren, Faye, Ellie, Riley, Porter, Tucker, Samantha, Ashlyn, Lauren, Megan and Audrey. Jane was a member of the Order of the Eastern Star, Women’s Circle at Hickman Mills Community Christian Church and GFWC Homemakers of Hickman Mills. Online condolences may be left at www.cullenfuneralhome.com.